Gurgaon is industrial and financial centre of Haryana. It is located near to the international airport and enjoys excellent connectivity to Delhi through NH8 and MRTS. It also has rapid metro network for internal connectivity within the city. Gurgaon has the 3rd highest per capita income in India. It is a hub of corporates, multinational companies, shopping malls and skyscrapers. Major corporates specifically belonging to IT/ITES, BPO and manufacturing are present here. NH8 and Cyber City house some of the top multinational and Fortune 500 companies. Gurgaon is also home to important organisations such as RITES, IFFCO, Power Grid Corporation of India etc. 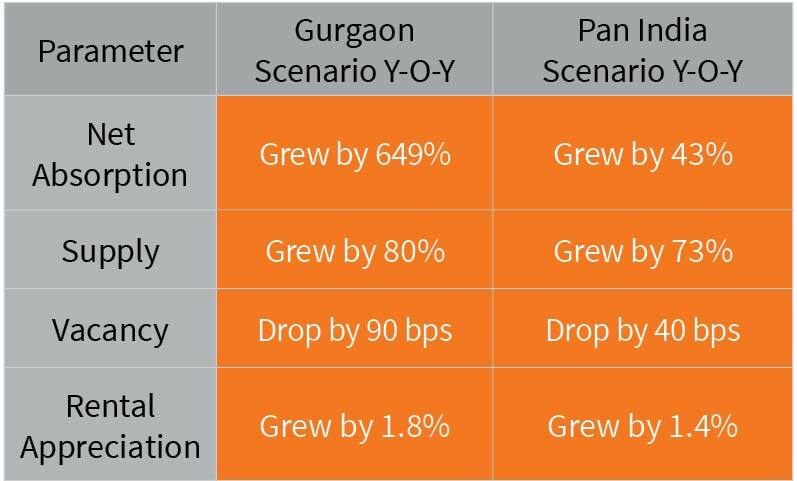 Over last ten years, Gurgaon has witnessed rapid growth in all the segments of the real estate sectors including retail, residential, hotels, healthcare etc. Gurgaon also have some of the outstanding townships and high rise condominiums/flats. It also has some of the popular mall developments such as Ambience Mall, MGF Metropolitan, DLF City Centre etc. 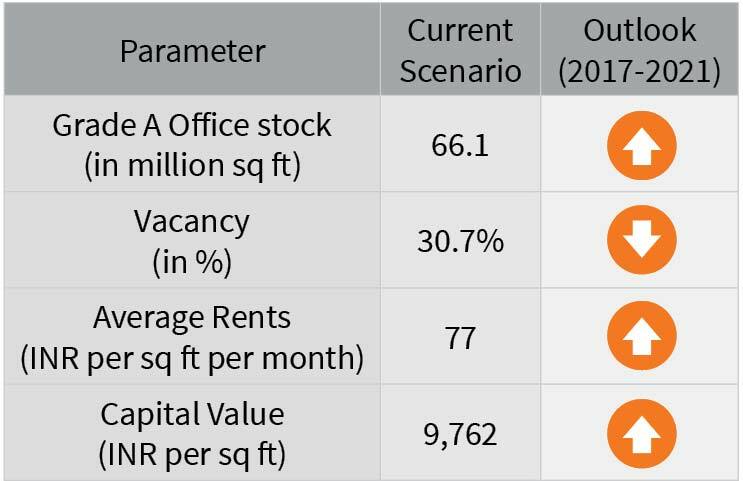 Gurgaon is expected to contribute a significant share of future office supply in Delhi NCR driven by projects in in NH-8, Sohna Road and Golf Course Extension Road. Gurgaon Office market consists of micro markets of NH8, Sohna Road, Golf Course Road and Golf Course Extension Road. 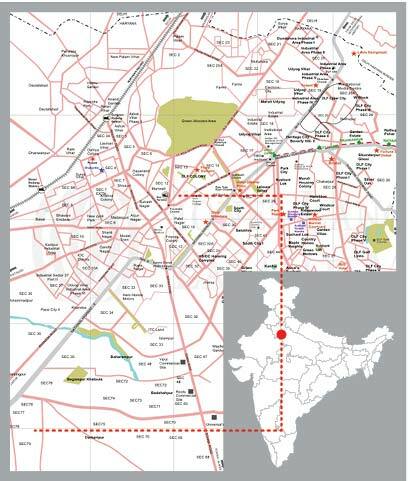 Spread across both the sides of NH-8, which connects Delhi to Gurgaon, the development is skewed towards the left (approach from Delhi) with DLF Cybercity defining the skyline. While it is dominated by IT Parks and SEZs and is thus driven by technology occupiers, it also has some prominent non IT projects which have performed equally well. Vacancy in DLF Cybercity and other prominent projects remains low. Current moderately high vacancy levels are on account of a vacancy in select projects with strata sale component and part of off-prime NH-8. Sohna Road and Golf Course Road is a clear alternative location for large space requirements which cannot be fulfilled in NH-8 prime buildings. Sohna Road has a good mix of IT, SEZs and non IT projects; however, many of these projects are on strata-title basis having been sold to smaller investors, though developers retain leasing rights in some of them. Vacancy in quality assets remains at acceptable levels while the strata-titled projects with poor management are suffering due to high vacancy levels.